Stop by the Chuck Wagon for a bite to eat – retro-style! – at Fort Wilderness Campgrounds! 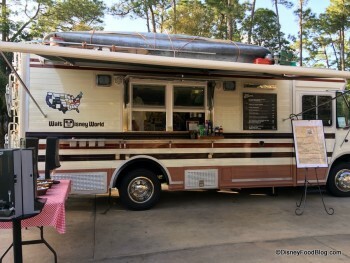 You’ll find this Food Truck serving Counter Service eats (along with classic camping snacks like S’mores Kits) at the Meadows Trading Post by Chip N Dale’s Campfire Sing-A-Long when it’s in operation (Tuesday through Friday evenings, and Saturday – Monday during the days and evenings). You’ll have to keep your eyes peeled, though, because this Food Truck is themed as an old school RV to perfectly blend into its campground surroundings! Hours of operation vary: typically, The Chuck Wagon is open for the evenings only on Tuesdays through Fridays. Saturdays, Sundays, and Mondays often offer daytime hours as well as evening. Guests can also bring their own snacks and food to the Campfire.